The Resource Dispersion Hypothesis (RDH) proposes a mechanism for the passive formation of social groups where resources are dispersed, even in the absence of any benefits of group living per se. Despite supportive modelling, it lacks empirical testing. The RDH predicts that, rather than Territory Size (TS) increasing monotonically with Group Size (GS) to account for increasing metabolic needs, TS is constrained by the dispersion of resource patches, whereas GS is independently limited by their richness. We conducted multiple-year tests of these predictions using data from the long-term study of badgers Meles meles in Wytham Woods, England. The study has long failed to identify direct benefits from group living and, consequently, alternative explanations for their large group sizes have been sought. TS was not consistently related to resource dispersion, nor was GS consistently related to resource richness. Results differed according to data groupings and whether territories were mapped using minimum convex polygons or traditional methods. Habitats differed significantly in resource availability, but there was also evidence that food resources may be spatially aggregated within habitat types as well as between them. This is, we believe, the largest ever test of the RDH and builds on the long-term project that initiated part of the thinking behind the hypothesis. Support for predictions were mixed and depended on year and the method used to map territory borders. We suggest that within-habitat patchiness, as well as model assumptions, should be further investigated for improved tests of the RDH in the future. Many social carnivores gain direct benefits from membership within a group such as those from group hunting , mutual defence of kills  or increased vigilance against predators . In such cases, direct fitness benefits of social behaviours appear to offer a satisfactory explanation for living in groups. However, other species, including the European badger in particular, do not appear to gain any such benefits of living in a group. Badgers do not forage in groups , or benefit from alloparental care ; rather, female reproductive success, and the body condition of both sexes, is lower in larger groups [6, 7]. Instead, the focus in the literature has therefore been to seek alternative explanations for why the badger, as an otherwise 'antisocial' species, aggregates in large communally living groups [8–10]. Since traditional explanations were lacking, early research on the badger in Wytham and elsewhere in the UK led to the suggestion that groups were formed, not because of any particular benefits of group membership, but rather as a passive result of food distribution [11, 12]. The 'Resource Dispersion Hypothesis' (RDH), described in detail below, was then proposed as a specific alternative mechanism for how passive group formation could arise on the basis of these ideas [4, 13]. The RDH is not mutually exclusive from some – as yet unappreciated – benefit of group living. Nevertheless, the hypothesis is particularly pertinent to consider as a potential explanation for group living as other fitness benefits of living in a group appear to be absent. After much debate in the literature, the RDH deserves empirical testing with the benefit of the now long-term, large-carnivore studies such as our own. Animals are expected to range over minimum economically defensible areas [14–16], but which satisfy their metabolic needs over time . If group size is increased via recruitment of additional members therefore, the territory must be enlarged to meet the increased metabolic requirements. Our study species, the badger, has been specifically suggested to minimise territory size (Kruuk & Macdonald, 1985). Contrary to these theoretical expectations, however, territory size (TS) does not increase with social group size (GS) in some carnivore species . This was also demonstrated among different badger populations across the UK  and specifically, within our study site, in large-sample tests over multiple years . The RDH proposes a mechanism to explain this independence of TS and GS, whereby territories are configured to encompass patches of dispersed resources, which are rich enough, when available, for a group to share with minimal competition. The 'resource' of interest in this study is earthworms: the principal prey species of badgers , which can constitute up to 90% of the diet in Wytham . The RDH predicts that, instead of TS increasing monotonically with GS, TS is constrained by the dispersion of patches of available food, whereas group size is independently limited by the richness of the available patches . That is, the size of the territory will be determined by the spatial distribution of resources in the environment. If they are more spread out, then to obtain equivalent resources the territory must be larger. With regard to the second prediction, regardless of territory size, the number of group members that can be sustained will be a function of the sum amount of resources available. If resources are distributed in patches (i.e. aggregated in space), simply increasing territory size does not necessarily increase the number of potential occupants that can be supported within it. The RDH has been applied to various species, apart from badgers, including red foxes Vulpes vulpes, Blandford's fox Vulpes cana, arctic foxes Alopex lagopus, brown hyenas Hyaena brunnea and kinkajous Potos flavus[26, 27]. While the RDH is widely recognised as a potential explanation for grouping behaviour in carnivores, especially those for which no other functional behavioural benefits of grouping are evident, it has been extended to the discussion of social behaviour in other species groups as well [32–34]. Its early formulations [18, 22] developed older models of foraging  that stressed the distribution of resource rich patches as crucial predictors of spatial behaviour of animals. Kruuk's pioneering work at our study site [11, 29] made badgers a model species after his observations of them highlighted the need for new explanations of sociality in this and other species that were group living but apparently non-cooperative [4, 5, 8, 9, 30]. The RDH was later presented as a statistical model  and then as a mathematical model by Bacon et al. (1991), that widened the analysis to continuous resource variation which made similar predictions while being more robust . Bacon et al. (1991) found that the predicted relationships were the same with small changes in parameter values, changes in the distribution of patch richness and relaxing of some assumptions in their formulation of the model. These assumptions included varying the time period over which the territories are maintained, the number of different resource types exploited, the distribution of patch richness, and the relationship between the mean and variance of a territory's yield. As a result of these investigations, Bacon et al. (1991) concluded that the RDH was likely to apply even where there are complex processes of group and territory formation. In the future, all of the assumptions of the model would usefully be tested in the field. However, the more urgent need is to produce tests, first of all, of whether the basic predictions – that are known to be relatively robust – are upheld among the species in question. Initial criticisms  claimed that the RDH lacked falsifiable predictions, but there are at least three: "...territory size is constrained by the dispersion of patches of available food, whereas group size is independently limited by the richness of these patches" (Carr & Macdonald 1986: 1541). This predicts that (1) GS and TS are independent, (2) GS is correlated with resource richness and, (3) TS is correlated with resource dispersion [4, 13, 31]. The more detailed model of Bacon et al. (1991) led to the derivation of these same predictions that Carr & Macdonald (1986) had originally made, but demonstrated them to hold under various changes of parameters and assumptions. In the latter study, an important assumption was required in deriving the prediction that GS and TS are independent. To reach that prediction, territory size was equated with the number of patches within it, which is valid providing the spatial dispersion of patches is independent of their richness . This step was required because the model is not explicitly spatial, but in assuming this link, the area of a territory can be indexed by the number of patches within it. This was deemed appropriate by the authors of the model and makes intuitive theoretical sense, given that larger territories are more likely to incorporate more patches. This assumption is not inherent to the model itself; rather it was required to support equating territory size with the number of patches. Our results show this relationship between TS and number of patches to be upheld in our data. Thus, empirically, the assumption made about patch dispersion in relation to richness is not required, since we were able to demonstrate that territory size is related to number of patches directly. Resource richness and dispersion are difficult to measure in the field , especially for badgers . However, they would appear very worthwhile investigating in detail with respect to the RDH since it is now established that the first prediction is upheld: group size appears to be limited by something other than territory size in various carnivores  as well as among different badger populations [11, 12]. Specifically, this prediction has recently been tested over all of the years of the long-term badger study in Wytham Woods , in which TS and GS were consistently uncorrelated without exception (using two different methods of territory size estimation), leaving open the question of what independently limits these variables. There have been suggestions for how to test further predictions of the RDH [18, 38], including by von Schantz (1984), and field tests have been reported [23, 39, 40]. However, very few RDH specific tests have been carried out so there is little empirical support. On the other hand, there have been no other published falsifications or objections to the hypothesis in the twenty years since its appearance . The handful of empirical data supporting the RDH [23, 24, 40, 42, 43] contrast with the absence of empirical evidence to refute it, with the exception of one case which found RDH predictions were not supported at low density . The problem is not that there is no support for this hypothesis, but that most studies do not specifically test RDH predictions, rather they invoke it after the event as the most parsimonious a posteriori explanation of observed patterns of social and spatial organisation. A recent review  found 20 studies that presented tests of data that were in line with the RDH, only 3 of which set out to test RDH predictions. Retrospective invocations do not offer good empirical support because they lack a priori hypothesis testing which are essential to scientific progress [45–47]. It seems, therefore, that situations consistent with the RDH emerge in the literature wherever positive support is noted post-fieldwork. In contrast, tests that fail to support the RDH are likely to be omitted from manuscripts in first place or, if they are submitted, to be rejected from publication because they only show a failure to reject the null hypothesis (which can of course occur for numerous other reasons). This is known as the 'file drawer' problem , in which a bias against publishing negative results is deemed to bias the overall evidence for or against a hypothesis, as assessed by meta-analyses. "For every published research study there may be several sitting in a researcher's file drawer, unsubmitted or unpublished because they did not turn up statistically significant findings"  (p.35). The consequences of this should not be understated, the effect has been demonstrated in both surveys  and an empirical study comparing significance levels in published and non-published studies of the same topic . An entire organisation has been established largely to control this effect in medical drug treatment trials (The Cochran Centre in Oxford; ). Because of this potential bias, specific tests of predictions are needed, regardless of the outcome, so that the weight of evidence – for and against – can be assessed. Sample sizes in the case of RDH tests are often small so few studies offer the statistical power necessary to support predictions of hypotheses, where they were tested, with confidence. What are currently lacking are unbiased a priori tests of specific predictions with concurrent information about resources. Apart from testing the predictions of the RDH, several assumptions of the RDH model are also yet to be adequately tested with field data. Some were already discussed with regard to the derivation of predictions. The RDH is, first and foremost, based on the assumption that the availability of resources is heterogeneous, a pre-requisite of the mechanism it describes. However, several studies have conducted tests of the RDH (and numerous others on other behavioural ecological hypotheses), based on the assumption that the blocks of different habitat types in the environment can be interpreted as resource patches [5, 12, 23, 37, 39]. This assumption is, however, rarely tested satisfactorily because: (1) it may be false to assume overall food availability is necessarily different between habitat types, even if potential food types within them are different and, (2) resources may be spatially aggregated within any one habitat type. Thus, even where different habitat types are documented to harbour a different availability of prey, spatial and temporal variation in aggregation within habitats would have important implications for territory configuration, social organisation and especially for tests of the RDH. Obviously, this is more important where territories are confined to a single habitat type, as are some badger territories (within woodland) in our study site. Although previous authors have acknowledged these assumptions and recognised they constituted imperfect tests, within habitat patchiness has not been empirically tested in this context before. 1. Comparison of estimates of resource availability in Wytham over 25 years. 2. Test of RDH predictions that: (a) group size is dependent on resource availability and, (b) territory size is dependent on the dispersion of resources. 3. Estimation of resource variation between and within habitats. 4. Test of whether resources, within habitats, are spatially aggregated ('patchy') and thus if habitat area is a good surrogate for resource availability. 5. Test for environmental correlates of resource availability. Table 1 reports estimated earthworm biomass per unit area in various habitats by this and three other studies separated by approximately 10 year intervals [21, 29, 53]. There was an enormous discrepancy in estimates between the earlier studies and this one (by an order of magnitude). This was expected because, as described in the methods, the older studies employed formalin sampling which forces worms up to the surface such that a given unit area of the surface will yield earthworms from a relatively large volume of soil. Our comparisons between years are therefore made on different scales. 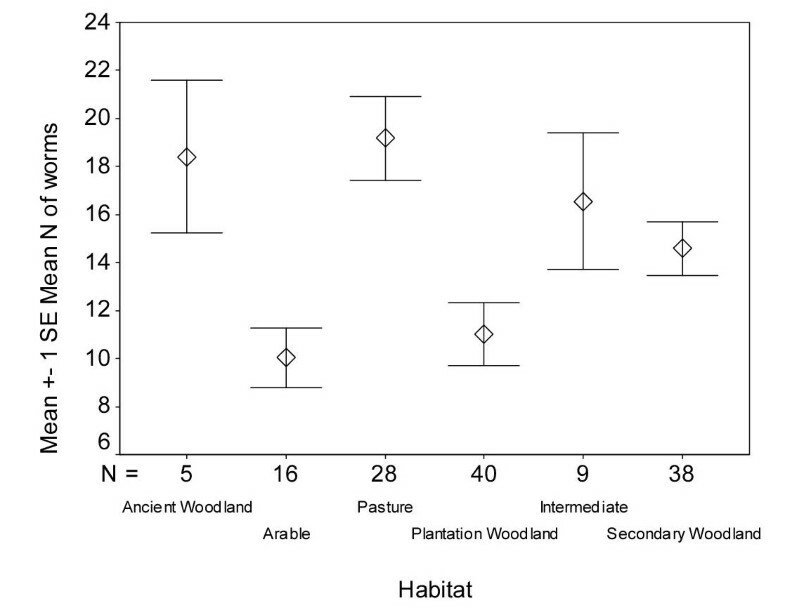 Figure 1 shows a comparison of the relative differences in the top three 'worm-rich' habitats established in previous studies of Wytham badgers [21, 29, 39]. Old woodland and pasture swap rank between Kruuk (1978b) and this study. 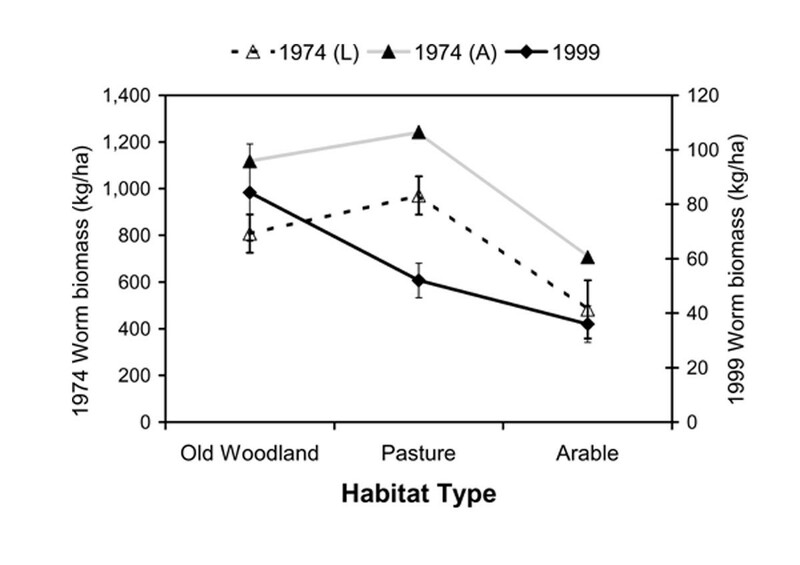 Comparison of indices of earthworm abundance in three major habitat types in 1978 and 1999. Data from the two years are on different axes because of differences in methodology. 1974 (L) is for Lumbricus terrestris only, 1974 (A) denotes all earthworm species. In 1999 figures are for all species. Error bars show +/- 1 standard error. Estimates of earthworm biomass per habitat, in comparison to previous studies 21,29,53. Standard errors were not calculable in retrospect for all species combined in Kruuk (1978) and were not given in Hofer (1988). * Cited in Hofer (1988). From the time of the previous study in 1989  until 1999, there were no major changes in the woodland ; some thinning was carried out around 1990 and, of course, the woodland has aged. The understory may also have changed to a small extent with the varying intensity of browsing by deer (they are sporadically culled). There were a small number of habitat changes in fields on the neighbouring University Farm (University Farm records). However, over the years since the last study in 1989 , there were hardly any changes in land use within the areas encompassed by the badger territories. (Two adjacent fields on the north-west woodland edge changed from grass ley in 1989 to arable by 1992. One of these changed back to grass ley in 1994 and the other in 1995. Since then, one returned again to arable in 1997. A different field at the centre-east of the study site was changed from grass ley to arable in 1992, and in the same year, one permanent pasture, also in the centre-east, became arable). All tests were conducted separately for data from individual years and further separated by two methods of territory estimation: (1) Minimum Convex Polygons (MCP) and (2) Interpolation (INT) (see methods for details). Where there were significant results in tests split by year and method, we checked them further with a Bonferroni simultaneous inference adjustment to control for multiple testing error. We never combined data from the two territory estimation methods (MCP and INT) because they are highly correlated . However, in some of the tests that follow we also tested hypotheses using pooled data (combined data from all years, but still separated by MCP or INT territory estimation method). We remind the reader that this assumes independence of data between years. There were often large changes in group sizes between years in our study population  and some data are separated by more than one year. Nevertheless, because between year data may not satisfy the criteria of independence, pseudoreplication remains a potential source of bias. We therefore focus on the independent tests for our conclusions. One of the assumptions leading to the RDH predictions tested here is that the number of patches correlates with territory area  (see page 464). (This would be expected since larger territories are more likely to incorporate more patches in an environment with a mosaic of patches, regardless of distribution. However, it should be specifically tested since it is an assumption crucial to deriving the predictions). This assumption is supported in our data; combining all years, the number of patches (as before, those known to be the important foraging habitats: arable fields, pasture and ancient woodland) correlated significantly with MCP TS (r = 0.439, N = 97, P < 0.0001) and INT TS (r = 0.563, N = 57, P < 0.0001). These were also significant if variation due to badger group size alone was removed first in a multiple regression (MCP TS: t = 3.153, df = 71, P = 0.002 and INT TS: t = 5.563, df = 54, P < 0.0001). Split by both year and method, the number of patches was significantly correlated with territory size in 6 of 8 tests (Table 2; the same 6 were also significant (P < 0.05) when variation in territory size due to badger group size alone was removed first in a multiple regression). We also employed a sequential Bonferroni technique for multiple comparisons, which controls for the increased number of Type I error rates in a posteriori multiple significance testing (false rejections of the null hypothesis) . Standard Bonferroni adjustments are not adequate, because they increase Type II error rates where more than one component hypothesis is false (i.e. they reduce power in detecting significant results). After doing this, 5 of the 8 tests were still significant under the newly derived significance levels, judged by a test of P i ≤ α/(1 + k - i) where each P-value is ranked in ascending order (P1, P2... P i ) for k tests. The adjustment thus gives a different critical P-value for each test. Number of patches of principal habitat and territory size. Asterisked P values are those still significant after applying the sequential Bonferroni adjustment. This improved adjustment may still be overly cautious because the variables under test are, to some extent, repeated each time – they are measures of things that are likely to be in approximately the same place in different years. Multiple inference tests are only problematic if tests are independent, not when multiple tests are likely to reject the null hypothesis for specific reasons. In the extreme scenario of our case, if territories and the patches within them remained relatively static over time while we measured them again each year, then regardless of the P-value, after a certain number of years a Bonferroni adjustment will eventually become so small that no relationship can be significant. Our corrected results are therefore, if anything, conservative. Excluding arable habitat, the number of patches correlated significantly with pooled MCP TS (r = 0.366, N = 97, P = 0.0002) and INT TS (r = 0.342, N = 57, P = 0.009). Split by year and method, 4 out of the 8 tests were significant (1994 INT: r = 0.469, N = 19, P = 0.043; 1994 MCP: r = 0.507, N = 20, P = 0.022; 1995 MCP: r = 0.504, N = 18, P = 0.033; 1999 MCP: r = 0.493, N = 20, P = 0.027). All others, r < 0.347, N = 18–20, P > 0.159. Applying the sequential inference test, only that for MCP in 1994 remains significant. Table 3 shows results of correlations between GS and estimates of earthworm biomass per-territory from this study as well as those made in former years at Wytham. There were only 3 significant correlations: (1) that pooling all years of the MCP method 1993–1997, (2) in INT 1993, and (3) in the study of Kruuk & Parish (1982) that compared different populations. The relationship between group size and estimated richness was always positive however, except in Hofer's (1988) study. Group size versus estimated territory richness across studies (two-tailed Pearson correlations). Relevant data were unavailable for those years not presented. No INT territory map was constructed in 1995. Between-year contrasts in group size did not correlate with between-year contrasts in territory richness (pooling all years, but split by territory mapping method, INT method: r = 0.089, N = 18, P = 0.726; MCP method: r = 0.134, N = 51, P = 0.348). No correlations between these variables were significant when split by both year and method (all r < 0.48, N = 17–18, all P > 0.05). Territory area was not significantly predicted by the nearest neighbour distance from the main sett to the three major habitat types (arable fields, pasture and ancient woodland) in any year (separate multiple regression for each year and method, with all three nearest neighbour distances in the model; all F < 3.1, N = 17–20, all P > 0.05). When data were pooled across all years and split only by method, a multiple regression model of distances to major habitat types was significant using MCP territory sizes (1993–1999) (F = 2.874, df = 3,93, P = 0.040), but not when using INT territory sizes (F = 0.560, df = 3,53, P = 0.644). Repeating this analysis while excluding arable land, the results were similar: split by year and method, with all three nearest neighbour distances in the model, one relationship was significant (1995 MCP territory size, F = 4.628, df = 2,15, P = 0.027), but for all others, F < 3.0, N = 17–20 and all P > 0.05. As in the previous analysis, pooled MCP territory sizes were significantly predicted by this model (F = 4.092, df = 2,94, P = 0.020) but pooled INT territory sizes were not (F = 0.387, df = 2,54, P = 0.687). Mean five-food patch distance correlated with MCP territory sizes pooled across years (r = 0.240, N = 97, P = 0.018, two-tailed) and bordered on significance (but was a negative relationship) with pooled INT territory size (r = -0.259, N = 57, P = 0.052, two-tailed). Split by both year and method, five-food patch distance was significantly correlated only with territory size in only 3 of 8 tests (Table 4). Only one of these (1997 MCP) remained significant using the sequential Bonferroni technique for multiple comparisons (described above). There was considerable scatter in these relationships pooling data for all years and showed indications of being non-normally distributed. After finding transformations of the territory area data that best approximated to normal probability plots, however, the relationships remained the same in terms of direction and significance (square-root MCP: r = 0.293, N = 97, P = 0.004; log INT: r =-0.206, N = 57, P= 0.124). Correlations between territory size (TS) and 'five-food patch distance' after Kruuk & Parish (1982). DTESS represents territories constructed by a Dirichlet Tessellation method 85,86 based on information on main sett locations only, and is included here for interest (not included in sequential Bonferroni adjustment) but should not be thought of a necessarily valid test of this prediction. Asterisked P values are those still significant after applying the sequential Bonferroni adjustment. Excluding arable habitat and combining all years, five-food patch distance was unrelated to MCP TS (r = 0.137, N = 97, P = 0.182) and INT TS (r = -0.043, N = 57, P = 0.751). Split by both year and method, none of the relationships was significant either (all r > 0.436, N = 18–20, P > 0.055). 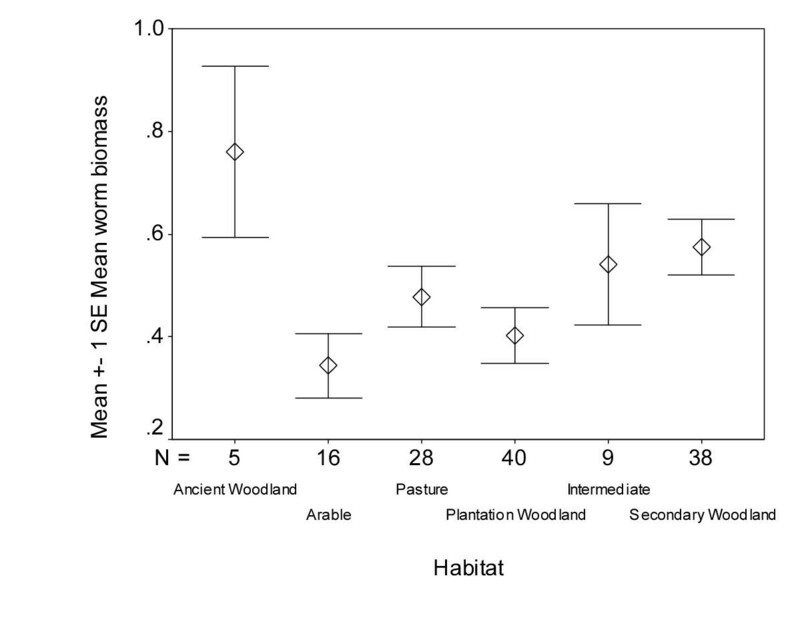 Both sample earthworm number (Figure 2) and sample biomass (Figure 3) varied considerably within any one habitat, but a one-way ANOVA demonstrated that the variation was significantly greater between habitats than within them (in square-root transformed biomass: F = 2.523, df = 5,130, P = 0.032; and number: F = 4.997, df = 5,130, P < 0.0005). This habitat difference was also significant with non-transformed biomass (Kruskal-Wallis: Χ = 18.720, df = 4, P < 0.001). In Tukey's post hoc tests for pair-wise multiple comparisons none of the means of different pairs of habitats differed significantly from each other (all P > 0.09). Earthworm number was a significant predictor of earthworm biomass (F = 210.361, d.f. = 1,223, P < 0.00001; R2 = 0.483; slope = 0.697, using data from all individual sample quadrants). Mean earthworm number per sample and habitat (1999). Mean earthworm biomass per sample and habitat (1999). Sample sizes dictated confining these tests to woodland (of all types). Wilcoxon signed rank tests showed that the variance/mean ratios of the earthworm sample were not consistent with 1.0 at patch size one (W = 54.0, N = 10, P = 0.008), two (W = 54.0, N = 10, P = 0.008), four (W = 42.0, N = 9, P = 0.024) and was borderline for patch size eight (W = 20.0, N = 6, P = 0.059). This suggests that earthworms within woodland are distributed non-randomly in space, at least on the first three spatial scales. Since non-random distributions can arise through either (1) spatial aggregation ('over dispersion') or (2) regular spacing ('under dispersion' – tending to some uniform pattern, such as a grid), we needed to further test specifically for spatial aggregation. Figure 4 shows the log transformed variance against the log mean. The superimposed 1:1 slope represents randomness in space at all scales, since a variance to mean ratio of 1.0 is expected within a homogenous patch (where two samples would have the same mean). That 30 of 35 (85.7%) points lie above this slope, suggests earthworms are aggregated rather than regular . 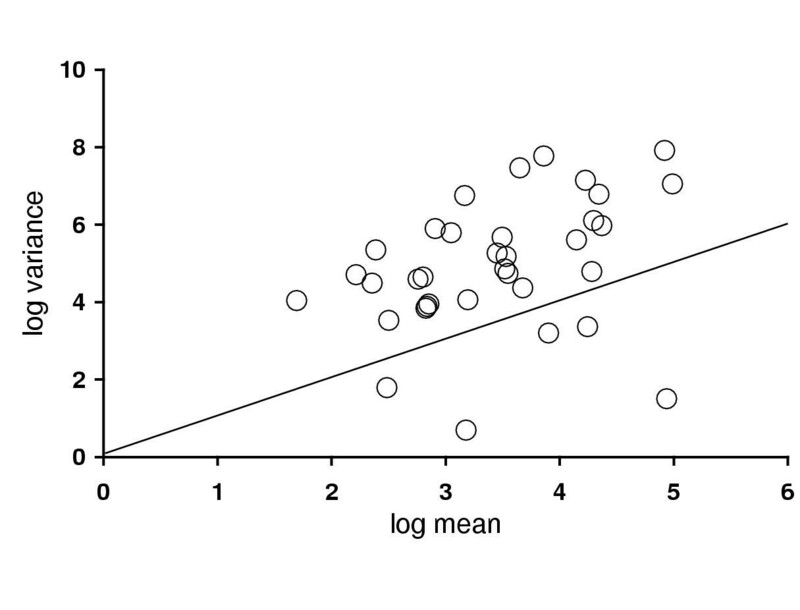 The slope of a least squares regression line through the origin was 1.39, implying that over dispersion tended to occur more at sites with a higher mean earthworm biomass. Log transformed variance against the log mean of earthworm number, for data grouped into four patch sizes. The superimposed 1:1 slope denotes randomness in space. Plotting chi-squared values for all variance/mean ratios against their degrees of freedom, the dispersion test  revealed that 27 values out of 35 (77.1%) were classified as aggregated, none as regular. Variance/mean ratios plotted against patch size categories (1, 2, 4, 8) (Figure 5), also suggested a greater degree of aggregation (larger variance/mean ratio) with larger patch sizes but this trend was not significant (Spearman's rank correlation: r = 0.334, N = 35, P = 0.132). Constant variance/mean ratios across all levels would indicate a fractal structure, i.e. patchiness following a self-repeating pattern at all spatial scales . 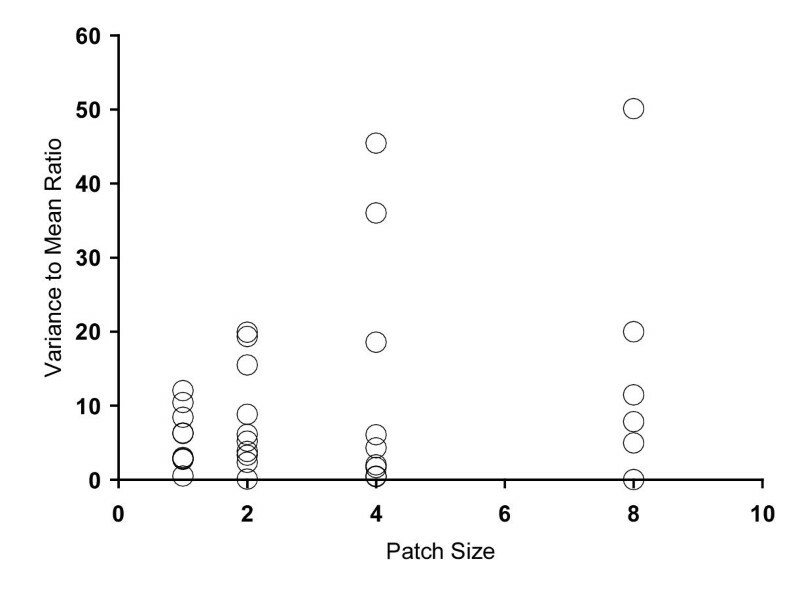 Variance/mean ratio plotted against patch size categories. Because different pairs of badger setts were not equidistant from each other, transects actually covered varying distances (mean: 427 m, range: 182 – 690 m and standard deviation:180 m), so it is not possible to estimate with accuracy the size of the patches represented by the 1,2,4 and 8 sample site groupings. However, if a best estimate were to be made using mean transect lengths, then these would be 5 m for patch size 1, 95 m for patch size 2, 190 m for patch size 3 and 380 m for patch size 4. Earthworm biomass was significantly related to a number of environmental variables. Three pairs of variables were highly inter-correlated (r > 0.40) (see Table 5) so only one of each pair was included in the model. These pairs were: air temperature and soil temperature, rainfall and humidity, ground cover and canopy cover. The latter variables in each of these pairs were removed from further analyses. Two-tailed Pearson correlations between habitat variables recorded during earthworm sampling. Using the four remaining variables and removing variation due to habitat type alone produced a significant model for (square root transformed) mean earthworm biomass per sample site (Type III sums of squares GLM: F = 5.096, df = 8,82, P < 0.0001). This gave parameter estimates for each environmental variable, adjusting for all other variables and over and above differences in habitat alone, indicating rainfall (t = -2.431, P = 0.017) and soil moisture (t = 3.082, P = 0.003) contributed significantly to the model (when the other two, both non-significant variables were removed from the model, F = 5.818, df = 6,82, P < 0.0001; rainfall t = -3.263, P = 0.002, soil moisture t = 3.426, P = 0.001). Removing from the first four-variable model just vegetation cover (the variable with the smallest t-value) produced the best model, judged by the lowest error mean square, in which all 3 remaining terms were significant (F = 5.848, df = 7,82, P < 0.0001; air temperature: t = -2.134, P = 0.036; rainfall: t = -2.697, P = 0.008; soil moisture: t = 3.090, P = 0.003). Da Silva et al. (1993) suggested that changes in the distribution of resources around Wytham Woods, via changes in other land use types into pasture, created more available feeding patches which permitted the increase in the number of social groups observed over the same period (1974–87). However, the number of badger social groups in the woods has continued to increase since then (16 in 1987, 21 in 1999), as has overall population size [54, 59], but there have been virtually no accompanied changes in land use. The hypothesis for such changes presented by Da Silva et al. (1993) may have been correct during that period of study, but it does not appear to be so any longer. Analysing the number of what is likely the most important habitat patches for badgers – fields of pasture [29, 39, 60], Newman (2000) found no significant relationships between the number of these habitat areas during 1989–1996 in Wytham and (1) year, (2) total badger population size or (3) number of adults. The hypothesis that recent changes in population and social organisation were due to an increase in resource availability was therefore rejected . Although the population increase does not seem to be attributable to increases in habitat changes per se, therefore, we do not know whether there has been an absolute change in the abundance of earthworms within any of these habitat types over this time. It remains feasible, for example, that changes in climate  or pesticide use could have caused overall changes in earthworm abundance [54, 61]. This cannot be directly tested because of different methodologies between the present and previous studies [21, 29]. Biomass estimates of the earlier studies were an order of magnitude greater than those in this study. This is most likely to be because the older studies employed formalin sampling which forces worms up to the surface such that a given unit area of the surface will yield earthworms from a relatively large volume of soil. However, earlier studies also used fresh weight rather than dry weight of worms and the time of sampling may have been different between studies (the exact sampling dates in the earlier studies are not given). Moreover, the crucial variable is the availability of earthworms to badgers, hence the methods used in this study to measure those earthworms available to a foraging badger. Previous studies that measured earthworm abundance from an unknown depth in the soil via formalin sampling may provide a poor index of how rich habitats were for badgers and their particular method of foraging. Of course, such measures of abundance and availability are likely to be correlated, but this remained an assumption in previous tests. Even studies conducted now that deliberately tried to mimic older methods would not produce reliable results for comparison because of numerous other variables involved in formalin sampling, e.g. time of soaking, permeability of soil, recent rainfall etc. Direct comparisons of earthworm abundance then and now are further complicated because old and new studies vary according to which habitat types were used in estimating earthworm biomass and sample sizes were also often small. Without such direct comparisons, the possibility that changes in resource availability have occurred as a result of changes in the climate in recent years (resulting in wetter summers and warmer winters in Wytham) cannot be ruled out. Nevertheless, the principal explanation for the badger population increase is thought to be a re-organisation of badger social structure and the increased use of outlier setts rather than hypotheses involving resource availability [54, 59]. Within the Wytham badger population, GS and TS have been shown, as predicted by the RDH, to be consistently uncorrelated over all the years of study (since 1974) , correcting for multiple inference bias. When the same test is conducted among different species or among different populations of the same species, if patch richness and dispersion are independent, the predicted relationship between group size and territory size by the RDH is, if anything, predicted to be negative . This is because an increase in patch richness (e.g. UK pastures rich in earthworms) may lead to a decrease in the mean number of patches per territory. Such a non-significant but negative trend is precisely what Johnson et al. (2000) found in comparing (1) different species of mustelids, and also (2) in comparing different populations of badgers across Europe. Kruuk & Parish (1982) also found a non-significant but (slightly) negative trend in group size and territory size between badger populations within the UK (r = -0.07). This accumulating evidence for the predicted relationships between group size and territory size provides good reason to consider the RDH as at least a possible mechanism to explain variation in social organisation in badgers. This is, as discussed in the introduction, especially important given that badgers are reported in the literature not to benefit directly from group-living [5, 9], leaving open the question of why they form groups at all. The RDH not only predicts this lack of relationship but also predicts alternative variables that should independently determine territory size and group size. There is, however, a lack of good empirical tests of these predictions within populations of any species and this study consequently set out to test them explicitly. The predictions of the RDH model tested here are based on certain assumptions, some of which we were able to test. First, because the RDH model is not explicitly spatial, in deriving the predictions in the model  it was necessary to equate territory size with the number of patches, which is valid as long as the spatial dispersion of patches is independent of their richness. This assumption was supported in our data with highly significant relationships between patch number and territory size in pooled data using both territory estimation methods, and in 6 of 8 independent tests (5 of 8 employing the sequential Bonferroni adjustment). The nested proviso within the above – that the spatial dispersion of patches is independent of their richness – remains as another assumption in the model. In terms of theoretical validity, there is no reason to suppose that resources should be systematically richer or poorer where they are more dispersed, and empirically, in our study site, badgers share a contiguous site with a similar mosaic of habitat patches. However, for the purposes of our tests we assumed that any one-habitat type has a certain fixed richness, regardless of its location (since we assigned resource estimates equally to all areas represented by any one habitat type). This was necessary because of limitations of manpower and time, but prevented a test of this assumption. Ideally, one would have continuous information on richness over all areas simultaneously. This would be a useful, if labour intensive, objective for future study. Secondly, the RDH predictions hold "provided the variability between patches is not too low" – with a coefficient of variation (CV) greater than "approximately" 0.5 31. If we assume that habitats are patches, we can make a crude test of this assumption. For earthworm biomass CV = 0.28 and for number, CV = 0.26. On the face of it, therefore, one may infer that variation is not large enough to establish the effects of the very mechanism we are testing for in the first place. However, the hypothesis cannot be rejected on these grounds, because the between-habitat variation, quantified above, is only one component of the actual resource variation. As well as spatial variation, there is temporal variation. Earthworm availability is known to vary (and this variation is crucial to the application of the RDH) with both weather [11, 29, 61, 62] and season [21, 63, 64]. Specifically, we know it to be significantly dependent on air temperature, previous rainfall and soil moisture, over and above any differences in habitat type alone [29, 65] (and this study). The spatio-temporal heterogeneity relevant to the RDH is therefore a combination of variation over time as well as variation over space, while the CVs reported above only measure the variation at one point in time. Moreover, we have argued that there may be spatial patchiness within habitats, which may add to the overall variability of the environment. In any case, Kruuk's (1978) data reveal that among the four Wytham habitats in his study, for Lumbricus terrestris CV = 0.60 and for all earthworm species CV = 0.52. Finally, we cannot rule out the possible additional variation in resources resulting from seasonal constraints on prey selection [20, 21] (for example, availability of cereal crops in summer, or scarcity of earthworms due to frozen soil in winter). The first prediction that group size is dependent on total resource availability was upheld using pooled data across all years with MCP territory size. However, this was not true with the INT method, and only 1 of the tests split by year and method was significant. Reformulating the test on the basis of correlated between-year changes in these two variables (contrasts) was also insignificant using either method. There is therefore little, if mixed, evidence for the prediction. Across all years, MCP territory size was significantly predicted by a multiple regression of the nearest neighbour distances to the three nearest "important" habitats (as defined on the basis outlined above). As above, this was not supported by the INT method. All the individual year regressions were insignificant (although 4 of the 5 with MCP territories were positive, all those with INT territories negative). Mean-five-food patch distance was significantly correlated with MCP territory size pooled across years but, once again, the prediction was not supported by the INT method, in fact it was negative. Only 3 of 8 independent tests were statistically significant (one was in the wrong direction), and this reduced to just one using sequential Bonferroni P-values. Excluding arable habitat, there were no significant relationships at all. Overall therefore, the difference in territory estimation method appears to be important because, broadly speaking, all tests of the RDH were supported in analyses of pooled MCP territory data (though not always by tests involving MCPs in individual years), while all were not supported using pooled data from the more traditional methods of interpolation (INT). Split by year, there was a mix of support among results using both methods. We deliberately used two methods, because the interpolation method is subject to assumptions about badger behaviour. Although estimates of the two methods do correlate , the latter assumes that all territories tessellate with common borders, they do not overlap, and often that outer boundaries without neighbouring badger groups are delimited by features in the landscape. In Wytham in recent years, such traditional assumptions, as well as the concept of strictly exclusive territories, have become difficult to maintain. Badger latrines commonly overlap each other  and there is evidence of large inter-territorial movements in data from trapping  and radio-tracking (C. Buesching, unpublished data). For these reasons, we prefer the MCP method (since it is based purely on actual latrine use) as a more unbiased estimate of the area which we know badgers of any one social group to be using. That was a prior belief , and both methods of territory estimation had been constructed before conducting the tests reported here. Other sources of error from uncontrolled factors influencing social group size or territory size could also have introduced too much noise to detect underlying effects. A specific change in the regulation of group sizes during the study period has been suggested [7, 54, 59] which may also have introduced noise into the data. Finally, it must be remembered that a lack of strong relationships in some cases may be because we can only approximate the total sum of earthworm availability. Those measures, aside from inherent estimation errors, do not take into account different times of year and other food sources. Where relevant, analyses excluding arable fields were repeated. Arable fields are not earthworm rich, and are classified as important habitat types for badgers because at crucial times of year they provide alternative food types (cereals crops, grain etc.) [21, 29, 39]. This food source is heterogeneous over a seasonal time scale, whereas earthworms in the other habitats represent heterogeneity over an hourly or nightly time scale . Therefore, we also checked results under the assumption that territories may instead be configured on criteria independent of arable fields. When excluding arable land, results were generally similar in the tests of territory size and distance to major habitat types and number of patches, but none were significant involving five-food patch distance. In general, relationships excluding arable habitat were weaker and fewer were significant, but results remain mixed in terms of support for the RDH, whether arable land is included or not. There is a plethora of studies of badger social organisation across the UK and increasingly from other sites in Europe [10, 66, 67]. These studies of badgers, and some from other species [68, 69] commonly refer to tests of whether the RDH fits as a post hoc explanation of social organisation, but assume that (while sometimes acknowledging it as an oversimplification) habitat patches are synonymous with resource patches. However, since spatial aggregation of resources within habitats is also feasible, future tests will need to verify that assumption. Patchiness or patch sizes have been estimated in other studies of social organisation [27, 36]. Like those, patchiness is difficult to measure and our tests have constraints, but it is nevertheless the first formal test of within habitat patchiness of prey in Wytham. We found various lines of evidence for patchiness at different spatial scales, which could have important implications for territory defensibility. Since the RDH suggests that a territory must be defended to contain a certain number of patches of a certain richness, within-habitat aggregations suggest a hidden layer of patchiness that may directly influence territory size and configuration. If we have succeeded in anything, it is showing that it remains uncertain what a relevant patch is. In future analyses additional sources of within habitat variation, such as forest rides, should be explicitly accounted for since they may have a small but disproportionate influence on resource availability and consequent spatial behaviour. Previous work on badger social organisation focused on patches of worm rich habitat like pasture and old woodland, or arable fields as sources of alternative food [5, 12, 21, 29, 37]. However, woodland in general was suggested to provide an especially important foraging habitat under certain conditions , which could mean that the previous selection of 'important' habitats was too simple. We now know in detail how the woodland habitat in Wytham contrasts strikingly with open areas surrounding it . In particular, continuous recording by automatic weather stations showed that, during the year, soil temperature never left the range 0–20°C under the forest cover, whereas soil under grassland or without vegetation did drop below zero and reached the mid twenties. During winter badgers may therefore find woodland to be a uniquely available foraging area as the soil in that habitat remains unfrozen in winter and, similarly, remains relatively soft in summer, perhaps serving a crucial role in maintaining some level of food security (i.e. earthworms remain accessible) during periods of unfavourable weather . It may be possible, using GIS, to construct a detailed spatial model of resource distribution using estimates that incorporate both habitat information plus data on variation in weather. This could give more realistic indices of spatial and temporal variation in food availability. Soil maps could also be integrated to such a model since underlying geology or soil type has been suggested to influence resource availability via interactions with different climatic conditions . Such an approach presents new problems, however, and a retrospective analysis by this method may be impossible. The purpose of this paper was to test whether, over the course of a long-term study with large sample sizes, the predictions of the Resource Dispersion Hypothesis (RDH) were consistently supported rather than simply being anomalies of past studies. This is, as far as we know, the largest ever test of its predictions. The assumptions of the RDH are also important in providing valid tests of predictions. We have made a first step in empirical research on the subject to determine whether the model assumptions are met in the field. These assumptions are, however, at least as difficult, if not more so, to test than the RDH predictions themselves. It should be remembered that violations of a model's predictions imply either (a) that the model is not valid, or (b) that assumptions within the model, rather than the model itself, are not valid . Therefore, while we were not able to test all of the assumptions in the RDH model by Bacon et al. (1991), our main objective of testing its predictions stand in evaluating whether the RDH – along with all of its various assumptions – provides a good model for the social-spacing organisation of badgers in Wytham Woods. Support for the predictions were mixed, and depended on year and the method used to map out territory borders. Our results indicate that it may also be necessary in the future to take into consideration within-habitat patchiness, in order to improve tests of the RDH. As with all hypotheses, we must await the accumulation of evidence that will gradually tilt the balance to support or reject them, and thus more hypotheses driven studies of the RDH are needed. While these tests of the RDH are not conclusive, this paper presents a priori hypothesis testing of specific predictions, as well as tests of some RDH assumptions, though others remain to be tested in future studies. It will be as important, for the development of the RDH as a predictive theory, to discover when the RDH does not provide a good explanation of spatial organisation as well as other situations where it does. The study was undertaken in Wytham Woods, 5 km NW of Oxford, UK (01° 18' W, 51° 46' N). Details of the study site can be found in Hofer (1988) and Kruuk (1978a), and the long term trapping study is detailed elsewhere [54, 59, 71]. Several studies have explicitly estimated earthworm abundance in Wytham [21, 29, 53]. Data were taken from these published studies and converted into common biomass per area units. A major problem remains in comparing estimates, because data collection methods varied. Even if the general methodologies had been similar, small variations in detail are likely to have affected results. Thus, to control for between study bias, data are presented on different scales, and attention is focussed on the relative availability per habitat. The most important distinction between methods is that most earlier studies used Formalin sampling [21, 29, 72], which causes earthworms to escape to the surface from an indeterminate and variable depth in the soil. It is also known that soil moisture and temperature affect formalin sampling which then require sampling efficiency corrections [21, 73]. Even then, formalin sampling informs us only about earthworm biomass in the affected volume of soil, which is dependent on permeability and other factors and, therefore, possibly very little about actual availability to badgers. In this study, untreated soil samples of a known volume were collected and hand-sorted later on in the lab which is considered to be a more accurate measure [74–76]. Sampling technique for earthworm studies is the focus of a "considerable debate" (Spurgeon & Hopkin 1999: 182) and there are obviously advantages and disadvantages of each method. However, the hand-sorting method, coupled with shallow soil samples, is more likely to index earthworms specifically available to foraging badgers because they eat earthworms on the surface but also dig down to reach them below it [20, 29, 65, 77]. They typically dig 2–4 inches into the soil  and do so enough to have earned them a reputation for damaging even pasture . The goal is to replicate the badger's style of foraging, and taking a known volume of shallow soil is the best of all of the current methods to mimic how a badger is likely to encounter and search for them. While still not perfect, it was considered a better method of assessing availability (rather than abundance) than formalin sampling. Hand-sorting was also the preferred method of other recent studies . Surface sampling with red torchlight  was not used because it omits worms just below the surface, may be sensitive to worms escaping, and returns a very small count per area which makes subsequent comparisons between samples less clear. Of course, between-study comparisons could have been better served by repeating precisely the methods of those previous studies, but this was deemed to be of lesser importance than using an improved method to estimate availability, rather than just abundance, in order to make RDH tests as accurate as possible. Apart from the problems raised above, no method of sampling can give a complete picture of earthworm distribution because unless it is continuous in time, it can give only a 'snap-shot' view – a one-off estimate – of what the real distribution might look like. This is an inevitable constraint of such studies. All earthworm sampling was conducted in June of 1999 to minimise any potential confounding effect of seasonal variation. This is before the very dry period of the year when badgers shift to other food sources such as cereals . Earthworms were sampled at the end of the night but before dawn (c. 0400 hours) along transects starting and ending 10 m from a pair of adjacent main setts. This experimental design was used to control for the potential confounding effects of the Passive Range Exclusion (PRE) Hypothesis , which predicts that earthworm availability is differentially depleted between neighbouring groups with lows at the extremes (at main setts) and peaks in the middle (at territory borders). There was no evidence for this, however (unpublished data). Ideally, one would sample with a stratified random design over a large area measured in its entirety. This, however, was constrained by the need to control for potential bias from the effects of PRE and also by manpower and time. Each of the 10 transects were independent in that any one sett featured only once in all transects. After being used once in any one transect, however, a sett would be excluded from being selected in all subsequent transects so the process cannot be strictly independent, but this was unavoidable given the limited number of setts (20 of a total of 21 main setts were used). A randomised procedure was used to select them at each stage nevertheless. Nine equidistant sample sites were marked out along each transect. At each of these nine sites, two randomly placed quadrants < 5 m from each other marked out the locations where two (one at each quadrant) 0.3 x 0.3 x 0.1 m (depth) soil samples were extracted by spade. Means of these pairs were used in later analyses unless otherwise stated. This was done as quickly as possible but it is recognised that a source of potential error remains in omitting any earthworms that escaped. If this does occur, then it is likely to cause some underestimation, but this should happen in all samples and is not, therefore, expected to cause any systematic bias. Soil samples were transported to a laboratory in sealed bags and hand sorted. Biomass was recorded as the total dry weight after oven drying of all earthworms (already killed) present per sample. An assumption leading to the predictions of the RDH is that the number of patches correlates with territory area  (see page 464). We tested this assumption empirically, using the number of 'patches' of distinct habitat areas within the territory. For this test, as in the forthcoming ones below, a 'patch' was defined as a habitat block delimited by alternative habitat types or field or forestry compartment boundaries. We use the term patch here, following the RDH terminology [4, 31], to denote an area of similar food availability, surrounded by areas with different levels of food availability. With the assumption that habitats can be equated to patches, they refer to the same thing. However, in the model, a patch does not necessarily need to be a habitat type. In the RDH model, it was stated that to enable the mechanism to operate, the variability between patches must have a coefficient of variation (CV) greater than "approximately" 0.5 31. We could therefore estimate the CV among the habitats we examined as a test of this assumption. Adult badger group sizes were estimated from trapping studies conducted since 1974 [7, 11, 21, 39, 54, 59, 71, 81]. Where possible, we analysed data from all years in which it was collected. However data for the years previous to 1993 are largely from published papers, for which original data for certain variables were not available or calculable. In those cases, we could only use the more recent data, since 1993. Our estimate of group size was the total number of different individuals caught in the setts of a social group in that year. We could also have used the minimum number alive (MNA) which adds badgers that, while not trapped in that year, were trapped subsequently (although not necessarily in the same group) and therefore assumed to have been present previously. Additionally, we could also have used census data from a survey made during three nights in May each year by volunteer observers. All three estimates are closely correlated , however, we used actual number trapped as in our previous studies [19, 37, 54], because census data have a number of sources of inherent bias and MNA estimates do not account for where untrapped badgers ranged during their absence, which is crucial for tests of resident group size and resource use. The number of adults caught in the relevant territory during the year reflect a resident group size, since trapping efficiency was both high and consistent among years. Over the period 1987 – 1997, trapping success ranged from 83.2 to 100.0% of the population [54, 59]. Summing for all habitat types in the territory provided a measure of total expected earthworm biomass in all patches for each territory and follows existing methodology for badgers [5, 12, 21, 39]. This was done separately for each year in which territory records were available. We used the following habitat types: (1) arable, (2) pasture (agricultural grassland), (3) semi-natural grassland, (4) urban (housing and developed areas in the village and surrounding farms), (5) ancient woodland, (6) secondary woodland, (7) plantation woodland, (8) wetland and (9) intermediate habitat types. The latter accounted for (very small areas) that did not fall into the eight other categories, and was typically transitional habitat such as the vegetation that occurred in unmanaged spaces between fields and woodland. Some agricultural grassland does not meet the definition of 'pasture' as 'land that is grazed', if those areas are cut for silage instead. Similarly, some of the semi-natural grassland is grazed and could therefore be termed 'pasture' by that same definition. However, here we have avoided using pasture simply to denote a field in which animals are grazed, in favour of recognised differences in vegetation types as given in the university farm records. We did not estimate earthworm biomass in the few areas of grassland habitat, although it featured on habitat maps, so we assigned it as a 0.237 fraction of the biomass found in pasture, the ratio reported in Hofer (1988; to 3 decimal places). Urban habitat was assigned the same richness since, although it is variable, gardens and lawns are likely to be at least as productive as pasture but these areas are only a fraction of the total urban area . This is not an ideal compromise but is more realistic than assigning a value of zero and only accounts for a small proportion of the total study area. Areas of wetland were assigned a value of zero. Habitat maps were modified for each year in ArcView GIS (ESRI) from vegetation maps of the Centre for Ecology and Hydrology (M. Morecroft et al., unpublished), and covered all the land area under study (i.e. there were no gaps of unclassified status). For each year, we therefore had two separate GIS data layers: the territory map layers were cross-tabulated with habitat map layers using an ArcView routine, which gave the areas of each habitat type constituting each territory. Because of habitat changes between 1993–1999, we used different maps for calculating the habitat areas of each year. All changes in land use were accounted for year-by-year in our calculations of habitat areas. Measures of expected earthworm biomass per territory from earlier years came from the literature but used different methodologies [12, 21, 29, 39]. Relationships between group size and resource abundance were tested using Pearson correlations. We also tested for relationships between 'contrasts' in these same variables, which provides a test for directional shifts in one variable concurrent with a change in the other (i.e. current-year-GS minus previous-year-GS, versus current-year-resources minus previous-year-resources). Correlation coefficients can then be used to test whether the direction and magnitudes of contrasts in X are significantly associated with those of contrasts in Y.
a) Nearest neighbour distances from the main sett to each of the three major habitat types:pasture, ancient woodland and arable fields – the three particularly important feeding habitats. In the 25 years since badgers have been studied in Wytham, these habitats have been consistently identified as important foraging habitats at one time of the year or another [5, 6, 9, 11, 21, 29, 39, 54, 55, 60]. Arable fields become particularly important feeding areas during summer months, when earthworms are difficult to find in the hardened soil  and badgers feed on cereals and grain on these fields instead [20, 21, 61]. Therefore, although these were not the top 3 ranking habitats in terms of the estimates of earthworm availability measured in this study, they are used here as a result of prior knowledge that has established them as the most important habitats for badger food at various times of year. b) Mean distance to the 5 nearest of these patches. This measure is the 'five-food-patch distance', derived by Kruuk & Parish (1982) as an appropriate measure for resource dispersion as relevant to badgers and used ever since in comparative studies of this species, both in Wytham and elsewhere [12, 39, 43]. It is of principal interest, given the long standing nature of this study and the focus on this well known species, to concentrate on an established measure that was derived on the basis of detailed field knowledge of its foraging behaviour. Kruuk (1978a,b) had followed foraging badgers over many nights by radio-tracking to establish a mean number of patches that were exploited on an average night. This gave a large sample estimate of mean resource patch use relevant to the mechanism of the RDH and its likely time-scale. Other radio-tracking studies since then have not contradicted this (C. Buesching, P. Stewart, D. Johnson, unpublished data). In each of the analyses described above that involved measures of resource dispersion, we repeated the tests while excluding arable land, because it is primarily important as a source of food other than earthworms, and it is important on a seasonal rather than a daily time scale. ANOVA was used to test for significant differences in sample earthworm biomass and number between habitats. One-way ANOVA also provides an implicit test of the null hypotheses that variation within habitats is larger than variation between them, thus providing a test of whether blocks of different habitat types are different enough to justify using them as a surrogate measure of 'resource patches' as used in the previous studies. If they do not differ significantly, then we may hypothesise that, to a badger, the various habitats do not represent patches with different food quantities. The spatial distribution of sampling sites along linear transects also allowed us to test the hypothesis that earthworms have a 'patchy' (spatially aggregated) distribution within habitats, rather than being randomly distributed in space. To do this we compared the mean and variance between different sub-groupings of samples, grouped at 4 different spatial scales. The first scale was simply the pair of samples taken at each sample site (randomly separated over an area < 5 m from each other). Means from such pairs were always used for analyses at all other spatial scales. These three remaining scales were partitioned, each in the same way, as groups of an increasing number of the samples as laid out along any one transect, such that data for groups of 2, 4 and finally 8 separate sample sites were grouped together for analysis. For example, for the last of these scales, 'patch size 8' meant that data from eight sampling sites, adjacent to each other along transects, were analysed together as one group. This included 16 samples in total because it contained a pair of samples (< 5 m apart) for each sample site. These data were independent in that any one sample featured only once in patch size 1, 2, 4 or 8. Invertebrates typically are not randomly distributed, but our principal interest here is to detect the spatial scale of maximum aggregation. Since the variable of interest is a count (number of worms), randomly distributed sample values should follow a Poisson distribution, for which the variance/mean ratio = 1.0 . We could therefore use Wilcoxon signed rank statistics to test whether the variance/mean ratios deviated significantly from 1.0, and this was done separately for samples of data grouped by patch size 1, 2, 4 and 8. A deviance from 1.0 in any of those four samples would indicate non-random distribution in space at that spatial scale. By plotting chi-squared values for all variance/mean ratios against their degrees of freedom, we could also use the dispersion test , to determine if these values fall into one of three possible zones representing aggregated, random and regular distributions. Theses zones are delineated by the upper and lower 5% significance levels of agreement with a Poisson series. The mapping of Χ2 values against their degrees of freedom onto the zone above the upper bound demarcates aggregation, those falling below the lower bound fall into the zone demarcating regular distribution. Anything else, falling between the bounds, cannot be rejected as belonging to a Poisson series, i.e. they are consistent with a random distribution of earthworms. We also tested for a relationship between variance/mean ratio and patch size using Spearman's rank correlation coefficient, as a test of whether aggregation increases with spatial scale. Some other variables were measured at the time of earthworm sampling: (1) canopy cover (estimated % coverage); (2) ground vegetation cover (estimated % coverage); (3) soil temperature (°C), with an electronic thermometer probe. Also, (4) soil moisture (% mass) was determined by weighing soil samples from each sample site before and after oven drying. Meteorological data at the time of sampling were recorded by an Environmental Change Network Automatic Weather station ; (5) air temperature (°C); (6) Relative Humidity (%) and, (7) rainfall on previous day (mm) were used in the analysis. We thank Paul Johnson for statistical advice, Michele Taylor and Angela London at the Environmental Change Network at Wytham for help in constructing the habitat maps, Sandra Baker, Amy Dickman, Bart Harmsen, Christina Buesching, David Slater, Chris Newman and especially Jane Bass for help with the field work. Pavel Stopka, Chris Newman, Michael Thom and Paul Blackwell provided useful discussion and criticism. DDPJ gratefully acknowledges the support of the National Environment Research Council and the J.F. Kennedy Memorial Trust. The long-term study is funded by a grant to DWM from the People's Trust for Endangered Species.